a good day split-boarding with dave B. and a bad day by myself! my last 2 adventures of 2009..
the best opening week of my life, to kick off one of my best seasons ever. my 2nd run from the 2010 olympic pipe finals. pretty much the best night of my life. and this was just awesome to be asked to do. my grouse mtn olympic torch "run", on top of their tram. mmmm powder! a lot of days like this last winter. testing boards and off surfing..
My trip to the south island of new zealand wasn't quite what i was expecting. usually i just want nice weather and good pipes and parks to ride. this year, we got generally hell weather, only got to ride a good pipe for 4 days (out of 4 weeks! ), and rode more powder in NZ then all my other years combined. which is obviously not a bad thing. So it definately made for a different style of trip down here then what i'm used to. My last week in wanaka was spent hanging out with the guys from Bataleon snowboards. We had a whole stack of 2012 prototype boards to test out. The new line is looking pretty cool. We got some new shapes, a few new models of boards, and that's about all i'm allowed to say. We toured around the local hills, powder day at cardona, snowpark days and a day at remarkables, which was real fun. 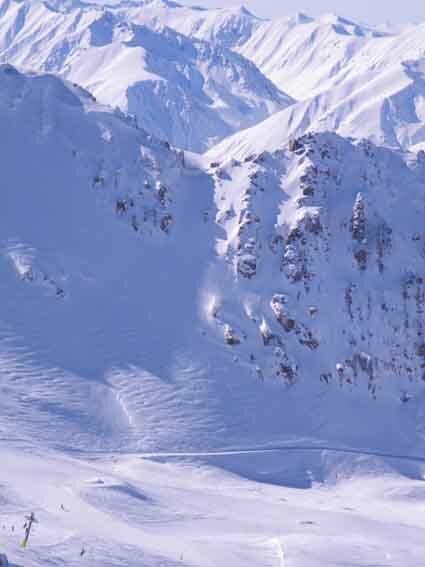 I'd only been to the remarkables one time before and thought the sidecountry terrain looked super fun. Snow coverage always seems to be an issue there, but not this time. As there was morning fog we cruised some park laps and tested the new boards. Then the sun started poking through to fun looking powder lines, which i was more than happy to hike to. Our web guy danny was keen to ride some lines so we spent the afternoon riding drops and skinny chutes. Danny almost drove himself into a rock wall at one point! I scoped a line with a little drop onto a snow patch, then you had to straight line out between 2 cliffs, dodge a rock then hook a good turn in front of a rock wall. I cruised the line, then turned around to watch danny. Seems the day's hiking and somewhat office legs were getting to him. He made the drop ok, stopped, then pointed it for the exit only to blow the turn. Luckily he had set enough edge before sliding out to just narrowly miss the wall. I had a good laugh, and so did the rest of our crew as they happened to see the line from the chairlift. After 4 weeks in Wanaka, i made my way up to the north island where i picked up my good friend scott gaffney and headed out to raglan to get some waves for a few weeks. our first few days were really stormy with barely any surfing, but then the wind died out and the points started firing! couple feet overhead for 2 days straight and awesome times. Today the wind is still dead but the swell has dropped some, so we're surfing on the local beach breaks as the points are a tad too small. I'm here for a few more weeks (scott leaves a week early), so hopefully we get some more epic times out on the points. I'll try and get some photos up from this part of the trip. but in the meantime, having more downtime at the moment my brain has been thinking of new things to build. So i thought i'd share a couple pieces i built earlier this summer. One is a key/sunglass box for the wall made from some scrap fir i had lying around. it has handcut dovetails, a carved front door, and a magnetic latch. The other is my new desk. I've been wanting to build one for a while and finally got to it. it's made from pine (stained black) and reclaimed fir flooring. the drawers and carcasses are held together with handcut dovetails again. the original idea for the top was supposed to be a slab of wood with live edges, but i found the flooring so i thought i'd try it out.